Done. Done done done. Done diggy done diggy done done done. The first draft is done. 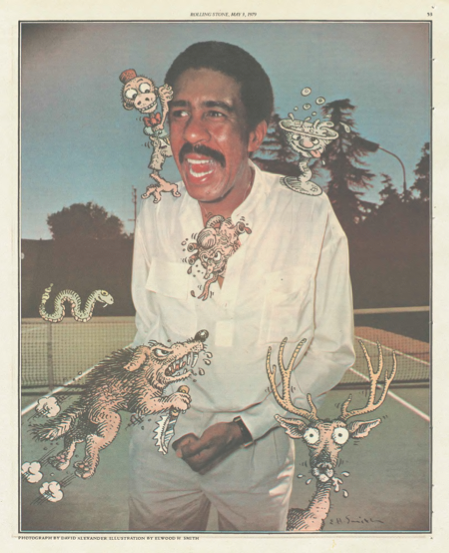 I headed out around 10:00 this morning; in need of a change of my change of scenery, I ended up at the Riverside Branch Library, and about two hours after powering up my computer, I wrote the last words of the last essay of Richard Pryor: American Id. From what I understand, they discourage loud whooping in public libraries, so I refrained. But hitting that save button for the last time (and then closing and compressing and emailing everything to myself, because I’m no dummy) was one of the most satisfying moments of my life as a writer thus far—not just because I got it done, not just because I challenged myself and proved that it can be done, but because I’m so wildly, blissfully happy with where this book is at. Again, work will need to be done; I’m already finding passages that are poorly worded and quotes that don’t work as well as I thought they would, and so on. But I think the book is on its way to being dynamite, without question the best thing I’ve written. So, yes. Hurray. After that, I closed up shop, walked a couple of blocks to a favorite pizza joint, ate a couple slices of pepperoni, and then went to the also-very-close Performing Arts branch of the library. There, I took another pass at the last essay (still not bad! ), and then did a job so dopey and mindless and arduous that I figured I should do it while I was still in a good mood from finishing: plugging in my full references, as they’ll end up in the notes at the back of the book, into the sometimes slapdash footnotes I threw into the Word doc. It’s nearly as fun as it sounds, and way time-consuming. But it was bothering me that it wasn’t getting done—and I also realized (since I’m using footnotes for the first time in a book doc; my Voyageur books just used a blanket bibliography at the end) that the footnotes are included in the word count, duh, so I actually wasn’t running as long as I thought on some of these. Anyway, with footnotes, the final word count is 25,285 (plus 654 so far on the bibliography, which I went ahead and pasted up in the process, since it’s so many of the same citations). That will need to shave down some, presumably; I’ll be reaching out to my editor to find out how much. From here, well, I’m gonna go home and have a nice celebratory dinner with the wife and little one. And then tomorrow afternoon, I’ll sit down and just read it straight though, doing only the quickest of fixes, to get a sense of how it reads and make sure I’m not repeating myself. This week, I’ll break off a couple of essays per night for more in-depth editing. By the end of the week, I’ll have a second draft, which I’ll then print out for my A Number 1 Editor, my wife, and also zip up and send out to a cabal of friends for feedback. They’ll read it while I’m in Austin at SXSW; I will not look at the book while I’m there, or hopefully even think about it. That space and time away from it will be vital to looking at it fresh when I get back, working in their notes and giving it however many passes it needs to be as good as possible when I send it to my editor at the end of the month.